In Tibet Buddhism is both a religion and a philosophy of life. It is a deep and comprehensive philosophical system that embraces life in all of its manifestations - from the simplest microscopic creatures to beings in dimensions beyond human existence. Buddhism views all of life as one inseparable whole. Buddhism is a disciplined practice of mental and spiritual path to develop compassion (loving-kindness for all beings) and wisdom (insight into the nature of reality). It is the path that was first taught more than 2,500 years ago by the Buddha Shakyamuni, who succeeded in achieving complete realization of perfect wisdom and compassion. It is a path that leads to the cessation of all sorrow (Samsara) and the experience of supreme joy (Nirvana). 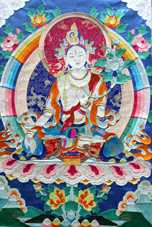 White Tara, the female manifestation of all Buddhas, is the goddess of compassion. Her love heals at the source of disease, bringing health, strength, longevity and beauty. Her white color indicates purity and complete undifferentiated Truth. Nyingma ("Old") School: This school of Tibetan Buddhism followed from the famous Indian guru Padmasambhava, affectionately known as Guru Rinpoche. He came to Tibet, from India, on invitation from King Tisong Detsen in 7th century. Named appropriately because they are the oldest school of Tibetan Buddhism. Padmasambhava built the renowned Samyey monastery (in Southern Tibet), which became a principal center of learning, where most of the Sanskrit texts and literature from India were first translated into Tibetan. Nyingmapas are usually mystic and their teachers may take on a consort. Old Khadampa School: Atisha is the teacher who brought the Mind Training teaching from Sumatra to India and then transmitted it to Tibet . He was born in India in A.D 982. He was first initiated into, and became an adept in, the esoteric and magical practices of Tantra which were very popular in India at the time, and in fact were to soon to absorb and extinguish Indian Buddhism. 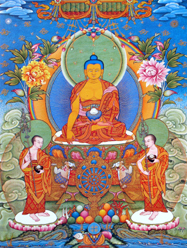 Kagyut ("Transmitted Command") School: Kagyutpas believe that the celestial Buddha Dorje-Chang (Sanskrit, Vajra-Dhara) imparted their first teaching to an Indian yogi Tilopa who lived in India during the 10th Century. Naropa, a celebrated professor of philosophy, in Nalanda University, succeeded him. 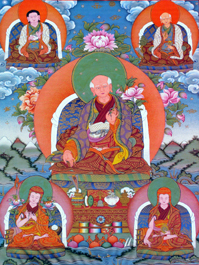 Among the disciples of Naropa were first of the Tibetan teacher of Kagyutpa sect, Marpa the translator. 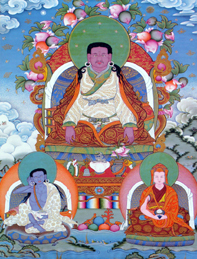 Milarepa succeeded Marpa. Kagyutpas are known for practicing advanced yoga like "tum-mo"(Mystic Heat Yoga) and "bardo" (Stage in between death and rebirth) yoga. His Holiness Karmapa belongs to this school. Sakya School: Named after its principal monastery situated in southern Tibet, founded in 1703 by Konchog Gyalpo. The heads of this school was the first to rise to political power in Tibet in 13th century along with the rise of great Mongol Khans. A 'patron-saint' relationship was established between the two countries then. 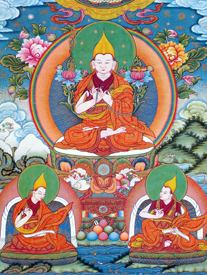 New Khadampa or Gelug ("Virtuous") School: Also known as the Yellow Hat Order was founded by Lama Tsong-khapa. 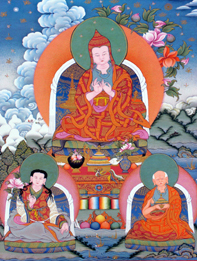 The Gelug tradition evolved into a fully independent school of Tibetan Buddhism towards the end of the fourteenth century, A.D. Lama Tsong-khapa stresses on the importance of monastic virtues and upon the need to establish a firm understanding of sutra teachings before graduating to tantras. 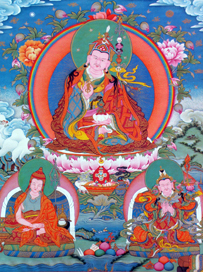 Lama Tsong-khapa founded the great Ganden Monastery in 1409. Gelug tradition spread all over Tibet and further, to Mongolia, where almost the entire population became devout Gelug followers. The teachings also spread through China influencing the successive emperors who became great supporters of Buddhism. His Holiness the Dalai Lama belongs to this tradition. Arjia Rinpoche is the reincarnation of the father of Lama Tsong-khapa.